Weight Management : Does Exercise Help or Hinder Your Diet? 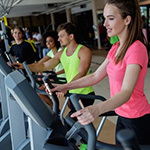 TUESDAY, April 12, 2016 (HealthDay News) -- Dieters sometimes worry that workouts could make them hungry, but new research indicates exercise has the opposite effect, diminishing the appetite -- at least temporarily. In two small studies, participants who burned the same number of calories through exercise as those who cut back on food intake ate almost one-third less at a buffet meal. Men and women also seemed to show similar hunger-hormone responses to exercise-induced calorie deficits. "Some researchers have claimed that women's appetites, appetite hormones and food intake are more likely to increase after exercise than men's," said study author David Stensel, a lecturer in exercise metabolism at Loughborough University in England. "Our new study shows that this is not the case -- at least over the course of a single day," he added. "We have seen this previously in men but were curious to see if women responded in the same way." The research was published in the March issue of the journal Medicine & Science in Sports & Exercise. In one study, Stensel and his team analyzed hormonal, psychological and behavioral responses to calorie control through exercise and food restriction over nine hours in a group of 12 healthy women. Participants whose calorie deficit stemmed from restricting food intake exhibited increased levels of the "hunger hormone" ghrelin and lower levels of a hunger-suppressing hormone called peptide YY, according to the study. At a buffet meal, these women also ate an average of 944 calories, compared to 660 calories for participants whose calorie deficits were created by running on a treadmill, the investigators found. In the other study, 10 men and 10 women completed 60 minutes of running at the start of a seven-hour trial. Appetite perception, appetite hormones and food intake after exercise did not appear to differ between the sexes. Stensel emphasized that the appetite-suppressing effects of exercise are strongest during vigorous workouts. "The take-home message is that exercise will not necessarily make you overeat or compensate by eating more food," he said. "There is a widespread perception that exercise will make you hungry and cause you to overeat. We have shown this is not necessarily the case, at least in the short term." Kelly Pritchett, a spokesperson for the Academy of Nutrition and Dietetics in Chicago, said she is curious how exercise might affect appetite up to 24 hours afterward, and not just in the very short term. "One weakness [of this study] is that the findings may not be generalized to a less-fit population, who may be more concerned with weight loss," said Pritchett. She is also an assistant professor in nutrition and exercise science at Central Washington University in Ellensburg, Wash.
Stensel and Pritchett agreed that more research is needed, including studies examining different types and intensities of exercise, and among groups of less active or fit individuals. "Our participants were young, fit and healthy -- most of them were university students," Stensel explained. "It is possible that individuals who are overweight will respond differently ... [and] also possible that exercise will cause compensatory increases in food intake over the longer term -- weeks and months."